Stephanie Anderson is the cofounder of Projective Industries, a micropress, and the author of several poetry collections, including Nightyard (Noemi Press) and In the Key of Those Who Can No Longer Organize Their Environments (Horse Less Press). 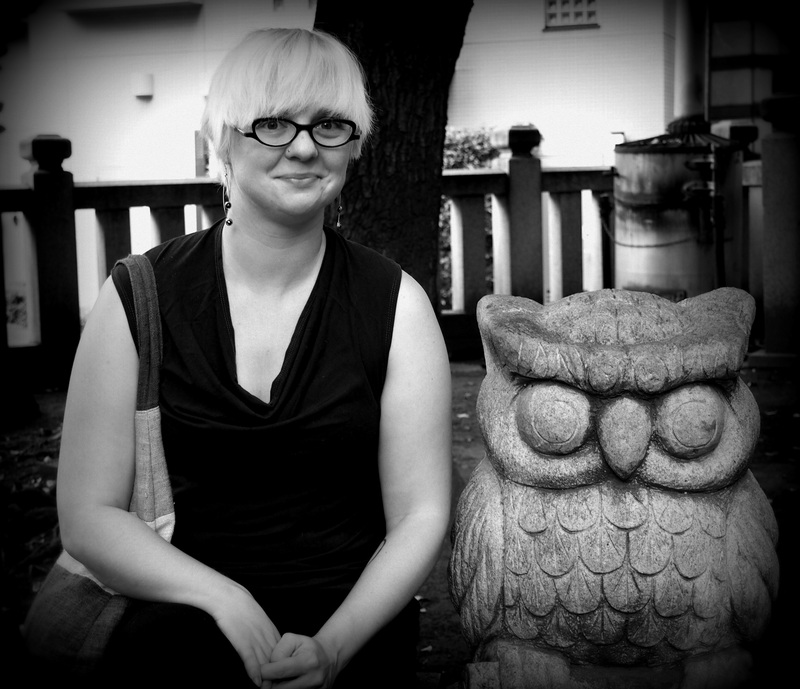 Stephanie is also a PhD candidate in the University of Chicago English Department. CMOS: You teach classes on chapbooks/small presses at the University of Chicago. How do you convey to your students what a chapbook is and why it’s important? CMOS: How did you first become interested in making chapbooks? SA: My first book was a chapbook, In the Particular Particular, published by DIAGRAM/New Michigan Press in 2006. The whole process was such a pleasure—Ander Monson allowed me a lot of input as regards the book object itself—that I began to contemplate making books myself. I like making things. I also discovered the chapbooks of the Pines (a collaboration between Brandon Shimoda and Phil Cordelli) and began to realize the possible flexibility of the form. CMOS: How did you come up with the name Projective Industries for your small press? SA: The press’s cofounder Sam Amadon came up with the name. He was thinking about Charles Olson’s watershed essay “Projective Verse,” in which Olson articulates the sonic and visual possibilities the typewriter allows the poet, and we liked the implicit reference to materiality and to older technologies, which chapbook publishers often use. I wanted a second term that would allow us to expand beyond books; thus industries instead of press or editions. CMOS: Can you tell us a little bit about your publishing process? SA: We hold an open reading period in June and usually receive around a hundred submissions. All three editors (the other two are Kate McIntyre and Karen Lepri, who live in New York) read and comment on each manuscript. From those submissions we pick, depending on our schedules, two to four chapbooks to publish the following academic year. 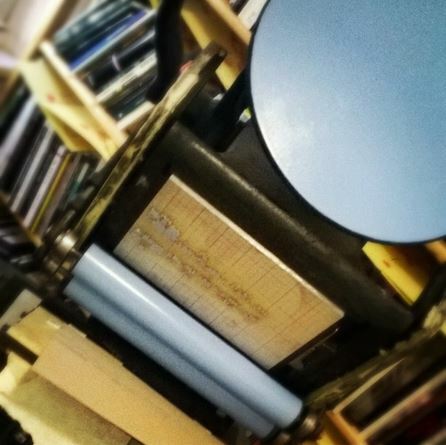 We began by printing everything on my small yet stalwart laser jet printer, but in 2012 we were able to acquire a platen tabletop letterpress, and we began to letterpress the covers of each book. I design the covers—I do a lot of designs, usually between five and ten, though if an author wants a particular piece of artwork we do our best to accommodate her; we also ask for authorial input regarding book size and paper color, etc. Kate lays out the interiors, which we still print on the laser jet, and we hand sew the bindings. Our print runs are 120, and we distribute the books via our website and at book fairs and conferences like AWP and the CUNY Chapbook Festival. CMOS: That must make each project a unique experience! 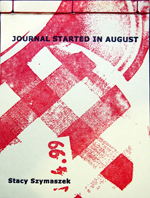 Can you walk us through the process of a recent Projective Industries chapbook? SA: One of our most recent chapbooks, Stacy Szymaszek’s Journal Started in August, w as accepted during last summer’s open reading. Because it’s a book of fragmented dailiness, we wanted to reproduce the notebook feeling of it as much as possible. So we decided it would be a rather small format, 4¼ × 5¼ inches, which made it too long (forty-six pages) to sew into signatures—or at least, to do a binding that wouldn’t be too time-consuming and onerous. Instead, we did a Japanese stab-binding, which is fun because we get to use a power drill to make the holes. For the cover designs, I walked around my house taking photographs of everyday objects. 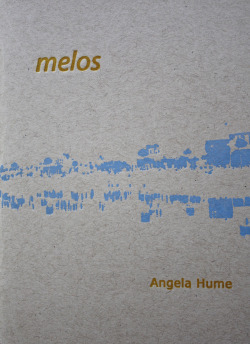 You can see a picture of the letterpress in progress (printing the cover of Angela Hume’s melos). CMOS: In a previous interview, you talked about chapbooks in terms of “looking forward.” Can you say more about that? How do you see the role of chapbooks in the digital age? SA: Chapbooks “look forward” because their methods of production and circulation are affecting book production more generally, or at the very least, are coemergent with other forms of book production. The increasing quality and decreasing cost of print-on-demand technology means that more small-press publishers of full-length books can operate like chapbook producers, ordering small runs of books at a time. It also means that presses like the Green Lantern Press here in Chicago can publish two runs of books—a larger trade run and a smaller run with a silk-screen cover, for instance. Chapbooks also are able to circulate outside immediate geographic confines because of the current ease of website building (via Tumblr, WordPress, etc.) and sales platforms (PayPal). So in interesting ways, technology has actually facilitated the production and distribution of the handmade. That said, I do think a love for and fear of losing contact with the material book object motivates some of the rise in the chapbook’s popularity. New technologies also encourage the ease of reading on-screen, which is fantastic because it allows publishers like Ugly Duckling Presse to readably archive their out-of-print chapbooks online and other publishers like Essay Press to continually innovate the form. CMOS: Does making chapbooks influence your own poetic process or inform the themes of your poetry? SA: It’s probably no accident that around the time we began Projective Industries I started writing my second manuscript, In the Key of Those Who Can No Longer Organize Their Environments, which is a book of cut-up, collaged words and phrases from texts by and about Canadian homesteaders. Making books has heightened my sense of language’s materiality. But for better or for worse, the condensed unit of the chapbook has also seeped into my sense of duration; a few years ago, I found myself writing longer poetic sequences that could be read in a single sitting but weren’t as long as a full-length book. CMOS: How much of a role do you play in the production or design of your own chapbooks by other presses? What is it like to leave something you have written in the hands of others to design and publish? SA: I think every writer is seized with anticipation over a book’s cover, no matter how many books she has previously published. I’d be lying if I said that that isn’t, for me, still the “big reveal” moment of the production process. However, learning more about book design has made me more attentive to—and particular about—the interior layout of the book. I’ve always been extremely detail-oriented; I suspect making books (and setting letterpress type, which I don’t do for our books but have done in print studios and enjoy as a kind of meditative practice) has made me even more so as an author, potentially to the chagrin of my publishers (e.g., “Can you insert another hair space here?”). CMOS: As a PhD candidate, you must spend a good deal of time analyzing poetry as well as writing it. What for you is the relationship between analyzing, writing, and printing poetry? SA: I do consider these practices—analyzing, writing, and publishing poetry—as different modes; however, there’s obviously a lot of seepage between them, because thought is uncontained and circulates like everything else. We lived in Japan last year, and while there I wrote a dissertation chapter on diaristic writings while also writing an extended and intensely syllabic “poemlogue.” I don’t think I could have written either piece without the other; the different practices taught me to think about my objects in various registers. In my critical work I do a lot of archival work, an interest that is surely partially motivated by being a practicing artist. CMOS: What is it like to see your own poems being reviewed or analyzed (e.g., on The Volta Blog)? SA: Seeing one’s own work reviewed or analyzed is usually gratifying—someone’s paying attention! I have a reader!—and intriguing. Even when you find it baffling, it’s a privilege to know how someone else reads your work. CMOS: Can you offer any advice to copyeditors of poetry? How does one go about copyediting language that deconstructs language? SA: Be generous yet careful. I like it when copyeditors highlight things they’re not sure about but don’t immediately assume they’re mistakes. A lot of poets are very intentional about spelling, spacing, and syntax, and obviously a lot of poetry doesn’t adhere to syntactical norms. When we copyedit for Projective Industries, we try to net everything that looks like it might be slightly off, but primarily so that the author can double-check those moments. CMOS: What is your favorite part of the publishing process? SA: Oh, by far my favorite part of the process is getting the alignment and imprint on the letterpress as good as I can get it, and then seeing the first few covers begin to stack up as I print. Stephanie Anderson’s Variants on Binding is forthcoming from National Poetry Review Press. ← Do You Follow Grammar “Rules” You Don’t Understand?